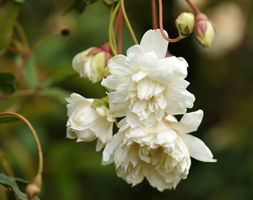 This beautiful rambling rose produces clusters of small, double, creamy-white flowers which have a delicious violet scent. Flowering earlier than many other roses (in April and May), it is best suited to a sunny site away from cold winds. Its slender near-thornless stems are ideal for training over an arch or pergola.